Three years ago, the world lost another icon: Prince. Prince Rogers Nelson, the Minneapolis-born, Rock and Roll Hall of Fame honoree and multi-Grammy-winning artist collapsed in an elevator and died of an accidental prescription drug overdose at his Paisley Park home and studios on April 21, 2016. Standing at just 5 feet 2 inches, the legendary Purple Rain singer was proof that physical stature is no indication of the impact an individual can have on the entire world. “No other single album influenced me as a teenager and into my adult years more than Purple Rain,” said Michael Stover, president of MTS Management Group and MTS Records. “The album is sheer perfection, and Prince was a once in a lifetime. I’ve always told people that Prince is the 20th and 21st century equivalent to Mozart or Beethoven,” Stover said. Prince’s groundbreaking 1984 album Purple Rain sold more than 20 million copies worldwide and produced such era-defining hits as “When Doves Cry,” “Let’s Go Crazy,” and the title track, “Purple Rain.” The album earned three Grammy Awards and three American Music Awards while the film earned an Oscar for Best Original Song Score, the last to receive the award. Just two years prior, in 1982, Prince released,“1999,” his fifth studio album which sold more than 6 million copies and was his first to reach the top 10 on the Billboard music charts. It proved that the crossover star was just getting started. Born on June 7, 1958 Prince was named after his father, whose stage name was Prince Rogers and who performed with a jazz group called the Prince Rogers Trio, according to the website PrinceVault.com. In a 1991 interview, Prince’s father, John L. Nelson, said he named his son Prince because “I wanted him to do everything I wanted to do.” With albums like “Prince,” “Controversy,” “1999,” “Purple Rain,” “Sign O’ the Times,” and “Musicology,” Prince released nearly 1,000 songs over his career. He has won multiple Grammy Awards, American Music Awards, a Golden Globe and an Academy Award. In 2004, Prince was inducted into the Rock and Roll Hall of Fame. That same year, he was named the top male pop artist of the past 25 years and Rolling Stone ranked Prince No. 27 on their list of the 100 Greatest Artists of All Time. “The highlights of Prince’s life are so many – how to pick one? From the first time I watched Purple Rain in the theater – where the girls in Boston screamed at the screen every time Prince was in a scene – to the Rock n’Roll Hall of Fame solo on While My Guitar Gently Weeps; to the most amazing Super Bowl halftime performance ever where Prince said ‘Can you make it rain harder?’ when a concerned producer checked in with him before he was supposed to go on; his life was one of brilliance that inspires us to this day,” recalled Terence O’Toole Murnin, a Prince fan who lives in Arizona. Another fan, Nicholas Wolaver, attended what would be Prince’s final concert series in Atlanta in 2016. 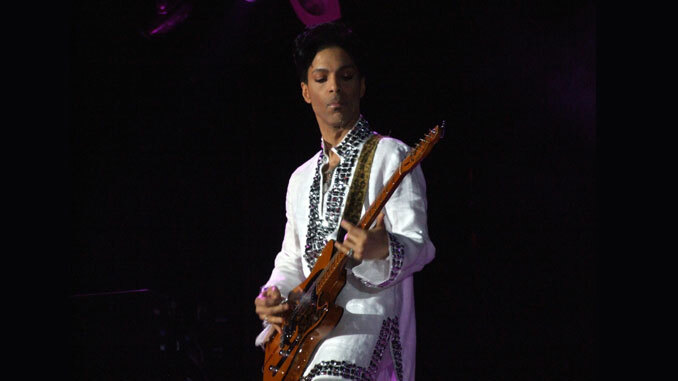 It was following that show that a plane carrying the superstar was forced into an emergency landing because Prince needed immediate medical attention for an apparent overdose. Doctors revived Prince and less than a week later as a private doctor was arriving at Paisley Park to help the singer with addiction, he was dead. “I started listening to Prince in the fourth grade with Little Red Corvette and other pre-Purple Rain hits on the radio,” Wolaver said. “Later my college journey took me to Minnesota where the local scene was much more informative about Prince’s impact there. I attended three of his concerts in Atlanta, including an arena show, an intimate performance with only a few hundred people and finally that penultimate concert at The Fox Theatre,” Wolaver said. “For the arena and intimate show, he was all about the guitar, while the piano was the centerpiece for the final events – he rocked any instrument he touched. I still have a recording from that penultimate concert on my phone and play it often and reflect on the life he led and music he created. He’s greatly missed,” he said. For Ginna Currie of New York, she said she’s thankful that famed director Spike Lee throws an annual block party in Brooklyn in memory of Prince. “I have been a Prince fan since 1979’s ‘I Wanna Be Your Lover,’” Currie said. “It is still hard to comprehend that there will be no more Prince concerts to attend. Every couple of years Prince was in the New York metro area on tour,” Currie said. “He was the consummate entertainer with singing, dancing and playing guitar, piano, drums. I listen to his music almost every day and I just wish [Prince’s] family would release the music inside the vault,” she said.